The most effective and popular way to replace your missing teeth is dental implants. They are uniquely designed to blend with the rest of your teeth, so they are the best long-term option in order to restore your smile. Dental implants are one of the biggest advances in dentistry in the past 40 years. They are very compatible with the rest of the human’s body because they are made of titanium and other materials. 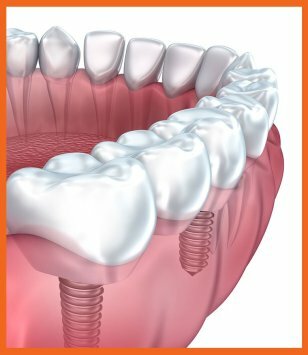 Implants are surgically placed in both upper and lower jaws; where they can replace missing teeth and function as regular ones. If you lost your teeth due to trauma, injury or periodontal disease and you need to fill the empty space in the jaw, feel free to arrange your consultation with the best specialists at First Class Dental and get the most qualified care possible. In order to receive dental implants, you need to have a sufficient bone structure and excellent oral hygiene. Because of this, you may need to have additional visits with your dentist, hygienist, and periodontist. After thorough examination and consultation, you will get your treatment plan. Some patients may need procedures to correct defects that they have with their bone structure. This may include sinus augmentation or bone grafting procedures. Remember, tooth loss influences more than your teeth and mouth, it can also influence your self-worth, confidence, appearance and overall quality of life. Implants can be the solution for many dental problems. After some time, you will forget that you have the implants at all! They feel as natural as your own regular teeth, and will help you rebuild your self-confidence again and smile more. Moreover, dental implants help you to prevent bone loss. When you lose your natural teeth, bone starts to reintegrate by changing his own structure and results in bone loss. All in all, dental implants are the best choice you can make for your teeth and oral health. Firstly, your dentist will fully examine your mouth. He will need to analyze your teeth, bone, gums and other tissues to make sure the implantation treatment would be successful for your case. For that, he may need to make X-rays and a CT scan, which would provide information about your bone density and bone loss. It will be necessary to make dental impressions to have a copy of your teeth and mouth tissues, so that doctor will be able to have models and analyze your case more thoroughly, offering the best treatment possible for you. Secondly, during implantation surgery, your dentist will use local anesthesia and make a small incision in the implantation area. Then he will drill holes in which the implant will be fixated. After surgery, you will need several months to recover and heal; so that the bone grows onto implant and make it stable. During this period of time, you will have a temporary crown on the implant, so you will not stay without teeth for a couple of months. Temporary teeth will feel and look as good as your regular teeth. It will help you to get used to speaking, chewing and you will be able to increase your eating habits. After that, the dental laboratory will pick the right color for your permanent tooth and the dental technician will be able to create and fabricate your permanent crown, which will be fixed on the implant right your bone is completely healed and integrated with your jawbone. Once you regain your smile you will definitely need to maintain protect it and maintain it for a lifetime! All you need to do is brush your implant and floss it twice a day. Good oral hygiene, regular checkups, and dental cleanings are necessary in order to keep your smile healthy and beautiful for a long time. You don’t have to stay with missing teeth any longer! Give us a call at First Class Dental and schedule your consultation now! Our team will do everything we can to give you the smile you always deserved. Call us: (661) 383-2888.